Chicken oysters at Crack Shack in Pasadena. 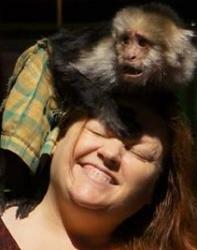 Photo by Elise Thompson. 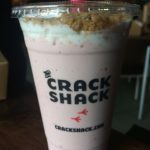 A few weeks ago founder Michael Rosen and Richard Blais of Top Chef fame brought the fourth outpost of the wildly successful Crack Shack to Pasadena’s Old Town. 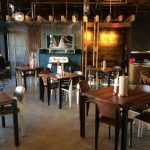 Loosely modeled on the ubiquitous chicken shacks of the South, The Crack Shack expands both the menu and the size of the typical “shack.” There is a large dining room, a bar area, an area with booths and a seriously gigantic TV for sports. They have wifi, but it would be great if they added a row of outlets under one of their long tables or counters for laptops. Of course, they don’t really need my suggestions as it is nearly impossible to find a seat in the huge hangar-like building on a weekday afternoon. The prices are more than reasonable, with all of the sandwiches priced at or under $12 and lunch for two hovering around $25. It’s hard to believe that they can turn a profit selling such quality ingredients as this low price point. They must do it by sheer quantity. The service is outstanding, and gets more and more personalized the smaller the crowd. 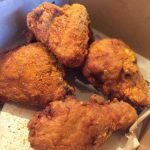 The eponymous “crack” is their spice mix, a carefully guarded secret, with which they coat the fried chicken. The seal on the coating is air-tight and practically shatters between your teeth. The pasture-raised Jidori chicken meat inside is hot and juicy, the skilled treatment a credit to its quality. The mini biscuits should be a required accompaniment to the chicken. 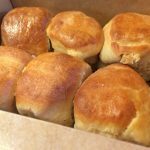 They are light like angel biscuits but hearty; I suspect they may be made with schmaltz. Although they are good enough to eat on their own, there is a miso-maple butter to spread on the biscuits. It’s unusual in that it’s not sweet like you would expect maple to be. People tend to furrow their brow at the first bite of the unexpected, but then slathered the butter generously onto the biscuit. 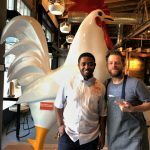 The restaurant isn’t just about the chicken. It’s also about the egg, which they source from Eben-Haezer Ranch and Gone Straw Farms. 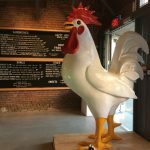 The Crack Shack opens at 10:30 a.m., so you can enjoy one of their sandwiches for a decadent yet comforting breakfast. 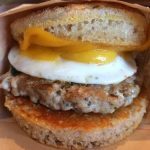 The Royale is made with a burger patty-sized peppery chicken sausage, a perfectly timed runny sunny-side-up egg and smoked cheddar on their homemade sourdough muffin. The bread-to-sandwich ratio was a bit much for me, so I ate mine open-faced, but that would be a plus, not a minus for most people. 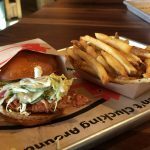 Other standouts are The Coop DeVille, a standard but not basic grilled chicken breast sandwich with pickled red Fresno chiles, pickles, lime mayo and Napa cabbage on a brioche. You might want to add bacon, although I didn’t feel the need to gild the lily. The Double Clucker is similar to a turkey burger with two juicy ground chicken patties, cheddar, bacon, avocado, burger sauce, pickles and crispy fried onions on a potato roll. 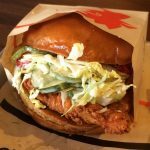 One exciting option I have yet to try is the Firebird made with a spicy fried chicken thigh topped with cool ranch, crispy onions, and pickles on a potato roll. 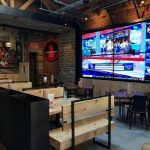 Although the menu doesn’t seem extensive at first glance, there is a lot of variety. 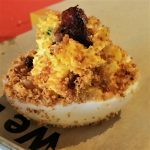 I loved the Deviled Eggs with French toast crumbs and candied bacon because the preparation was simple. It was all about adding fat and texture. They didn’t screw it up with strong flavors like vinegar or mustard. Some people complained that it was too bland. In that case, I recommend one of their many sauces or even a few dashes of Tabasco. One dissenter said it needed wasabi. If you are going to demand something that weird and specific, you are going to have to carry it in your purse. You can’t fault a restaurant for that. One complaint I do have is that chicken nuggets are only sold in the children’s meal. Marijuana is now legal in California, and I say nuggets for all! Especially when they have such a tempting variety of dipping sauces. They do have one spectacular ode to stoner food though—Mexican Poutine. The French fries, for a start, are fried in a combination of duck fat and schmaltz, which is genius. Props to Blais for bringing chicken fat out of the delis and into his kitchen. 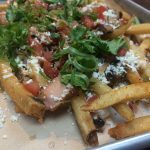 With house-made jalapeno cheese wiz, pico de gallo, and a pollo asado that will be a game-changer for anyone avoiding red meat, it is hard to stop eating the Poutine—but it is so rich you really have to share. You could make a case for chicken oysters being a grown-up replacement for nuggets. We aren’t talking about “Rocky Mountain oyster” oysters. The chicken oyster is one of those chef secret fetish things. It’s a little oyster-sized bit of dark meat near the thigh that is supposed to be the best part of the chicken. 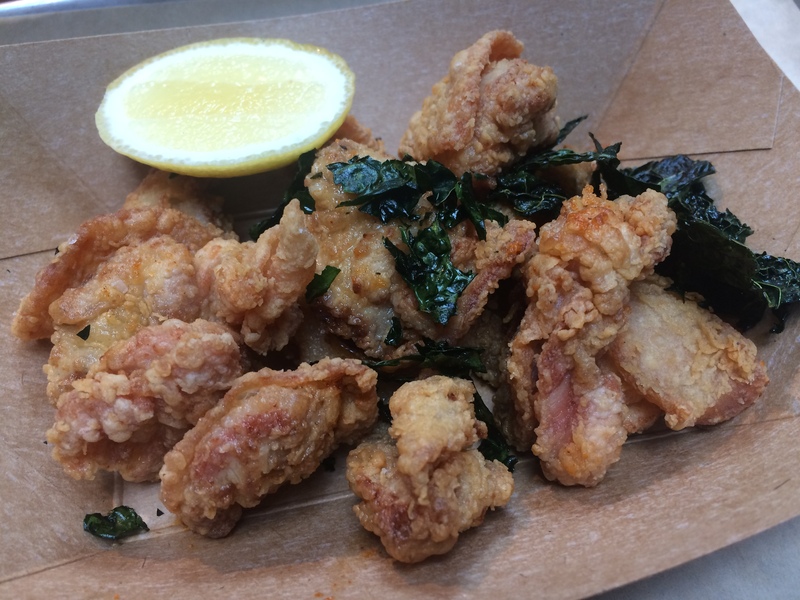 Instead of the heavy, crunchy coating that is used on the bone-in chicken, the oyster coating is light like tempura, similar to the treatment of gizzards at Dinah’s, one of LA’s classic fried chicken joints. In fact, the oysters are a great substitute for gizzards or hearts, intense, dark and sweet, but without the sinister taste of offal. 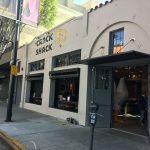 My second visit to Crack Shack was during one of LA’s rare rainy days, fitting weather for tucking into their Matzo Ball Pozole. Successful fusion dishes happen when something with a similar vibe is used. The matzo ball was rich, yet light, and soaked with the meaty broth it reminded me of albondigas. The broth itself was deep and complex, an amalgam of properly layered flavors. The soup was served with all of the correct toppings—crispy tortilla strips, radishes, cabbage, avocado, and a lime dipped in chile powder. 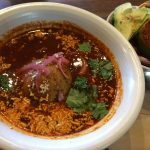 Although it may seem like something just added to round out the menu, the pozole is, like everything else, well thought-out and good enough to stand on its own. There are a number of vegetable-based bowls that will please the vegans and other healthy types. The Border Slaw is a nice mix of papaya, mango, jicama, coconut and pineapple with a dash of chile pepper, a touch reminiscent of Tajin, the chile-salt seasoning often sprinkled on fruit by street vendors. 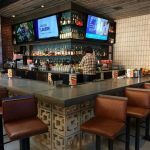 The restaurant boasts a full bar with a selection of craft cocktails like the Frozé, a strawberry rosé slushie, a tiki-inspired drink called Resting Beach Face and the seasonal Hay Ride, with spiced rum and ginger. Wine is served by the glass, half-carafe and carafe. There are 12 beers on tap including local selections like Modern Times, Stone, and Smog City. 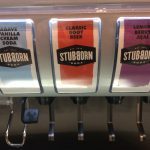 The soda fountain is stocked with Stubborn Soda, another company that prides itself on all natural ingredients and exciting flavor combinations. They even have a company mantra on their website. There is something for everyone, with standards like Root Beer and Black Cherry alongside Lemon Berry Acai and Citrus Hibiscus Orange. The Agave Vanilla Cream Soda works for diabetics and those avoiding other forms of sugar (although Stubborn does not use corn syrup in any of its drinks). They also have a calorie-free cola. For those of you who fear the unfamiliar, there is also Pepsi. 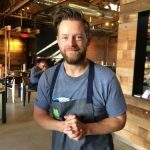 Which is actually kind of a surprise, as Richard Blais comes from Atlanta, the home of Coca Cola. 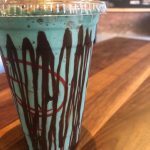 This entry was posted in Food and tagged Afters Ice Cream, chicken nuggets, Cookie Monster milkshake, Crack Shack, Dinah's, Eben-Haezer Ranch, FLIP, fried chicken sando, fried chicken sandwich, Gone Straw Farms, Michael Rosen, munchies, Poutine, Richard Blais, Top Chef. Bookmark the permalink.